MANATEE COUNTY, Fla. – A local congressman is calling for new protections for Florida farmers – a legislative push that comes after the I-Team exposed how state tax dollars are helping the competition in Mexico. "The farmers, all they want is a fair shot – not the dumping and all the other anti-trade practices that are going on,” U.S. Rep. Vern Buchanan, R-Longboat Key, told reporters Tuesday. "I think our bill will get them more at the table and try to eliminate a lot of the craziness that's been going on in the industry," said Buchanan. Buchanan said the bill would level the playing field for Florida farmers, who compete with cheaper produce shipped in from Mexico. “They pay little or nothing for their labor,” said Buchanan of Mexico. The call for action comes after the I-Team uncovered the University of Florida developed new types of blueberries to help Florida growers, and then sold the rights to grow those same blueberries to competing farms in Mexico. The public university also licenses blueberry growers in Argentina, Brazil, Chile, Peru and Japan. UF brought in more than $5 million in blueberry royalties last year from foreign growers and Florida farmers. The university says 70 percent of those royalties go back into its blueberry breeding program. 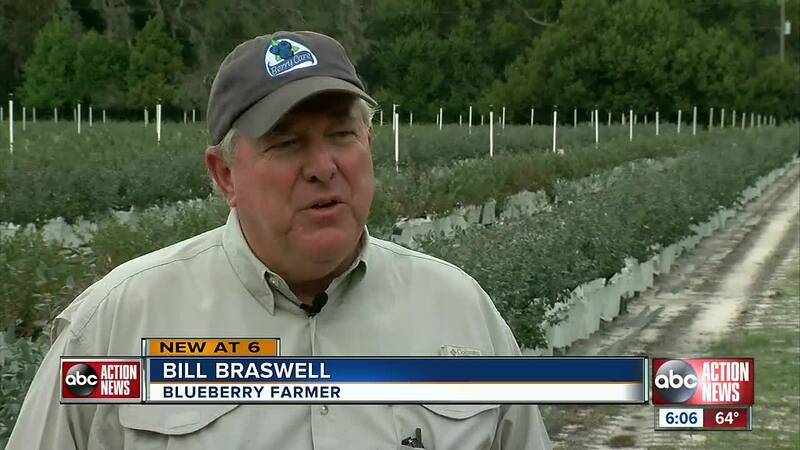 UF leaders have said the university creates new blueberry varieties to help Florida farmers, like Bill Braswell, make a living. Braswell opposes the university’s licensing agreements with foreign competitors. "It's like well wait a minute. It's Florida tax dollars. They should be going to help Florida,” Braswell told the I-Team last month. Over the past three years, taxpayers have contributed close to half a billion dollars to UF's Institute of Food and Agricultural Sciences, which houses the blueberry breeding program. Dr. Jack Payne, a vice president and the top decision maker at that institute, told the I-Team it's impossible for the university to stop the international theft of plants. U.S. Rep. Darren Soto, D-Kissimmee, called for changes in the wake of the I-Team's findings. "I think the University of Florida and other land grant universities should be careful not to engage in licensing agreements that are going to hurt the very farmers they're supposed to be helping protect. If it’s funded by Florida taxpayers to benefit Florida agriculture, then that should be the consistent mission,” said Soto last month. Soto is one of nearly a dozen Florida lawmakers who have signed on to co-sponsor Buchanan’s bill. Since the I-Team’s investigation, the university pledged to change its ways, telling the Florida Blueberry Growers Association it plans to put Florida growers first when it comes to new deals with foreign competitors. In an email to the association, representing some 500 growers, leaders at UF wrote, “In foreign countries that pose a potential competitive threat, our new licenses contain clauses that prohibit fruit of our licensed varieties from being imported to the U.S. during the Florida blueberry production window." The university has yet to respond to questions about whether it plans to revise its current agreements with foreign farms.